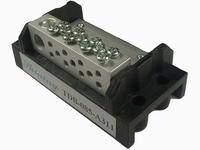 Shining TDB-085 series power terminal blocks: Rated voltage, 600V. Rated current: 85 A, 1 input, multiple outputs. Item No. TDB-085-A205, TDB-085-A311, TDB-085-417.